Director Oliver Stone and writer Quentin Tarantino created one of the most controversial movies of the 90’s in Natural Born Killers which is an MTV style film about serial killers. After murdering a string of people, Mickey Knox (Woody Harrelson) and Mallory Knox (Juliette Lewis) are on the run from the authorities as director Stone goes into the “creation” of these characters which includes their not so humble beginnings. For instance, Mallory Knox became the twisted woman she is today after years of abuse from her father which is played quite chilling by comedian Rodney Dangerfield. Mallory’s life soon changes when she meets Mickey who eventually murders her father and from this moment, their fates are set in motion. From there, Stone uses a variety of strange cinematography effects which goes into the psyche of these two disturbed individuals which includes the pointless shooting of a police officer and the strange obsession of Wayne Gale, a crime report which is played brilliant by Robert Downey Jr. Stone also brings forth a variety of societal norms and propaganda which is set into play in this strange and disturbing film about how society’s evil can sometimes create another evil. The transfer to high definition is rather impressive which faithfully increases the original vision of Oliver Stone through his use of strange colours and animations. The images are quite sharp and the colours are quite vibrant in an ethereal way. 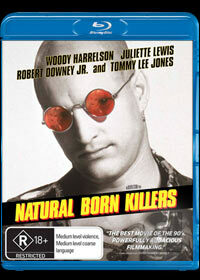 Natural Born Killers also contains a decent TrueHD 5.1 soundtrack that makes good use of the soundtrack, while keeping the audio exceptionally sharp. There are a variety of additional supplements on the Blu-Ray version which will keep fans of the movie quite entertained and gives you an almost open-ended insight into the creation of one of the 90’s most controversial movies. Needless to say, when I originally saw this movie when it was first released at the cinemas, seeing it a second time still left me with the same emotions and proves that Stone’s powerful vision is still as potent as it was in 1994.